After reading Lizzy’s ‘bad blogger’ post the other day I got to thinking about which blogger stereotypes I embody and which I oppose. I agree with her post entirely – what is it about macarons, Jeffrey Campbell shoes, Starbucks and ombre hair that gets everyone so hot under the collar? It will be a cold day in hell when you see me tottering down the street on my Litas with two-tone hair, a mocha latte skinny frappucino in my hand, nibbling a macaron. There are a few blogger stereotypes that I can identify with, though. One of them is having a penchant for ugly clothes. You know when you see someone’s outfit post and despite the fact that their frock is devastatingly hideous, they look fantastic in it. I like those kind of ugly clothes. 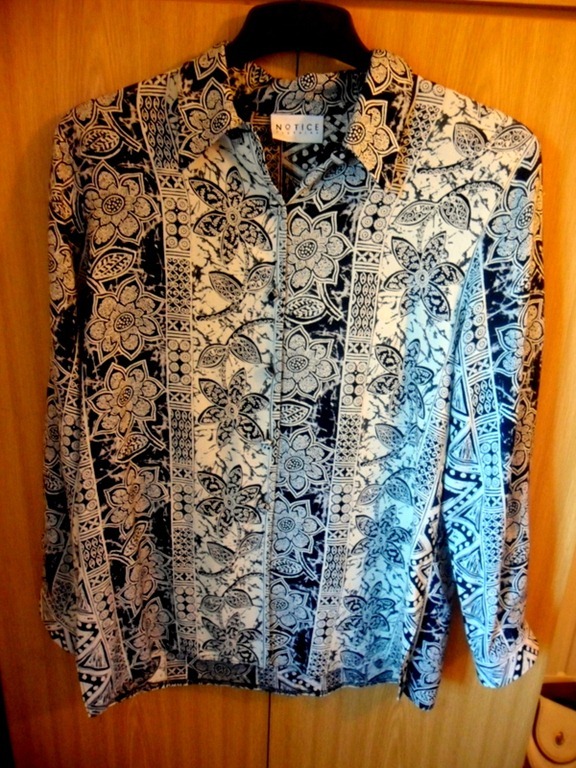 Bonus points for calling it vintage when the description ‘second hand’ might be more apt. Now that – that is just ugly. Amusing, but altogether unwearable and unpleasant. These are the kind of ugly clothes I’m talking about. 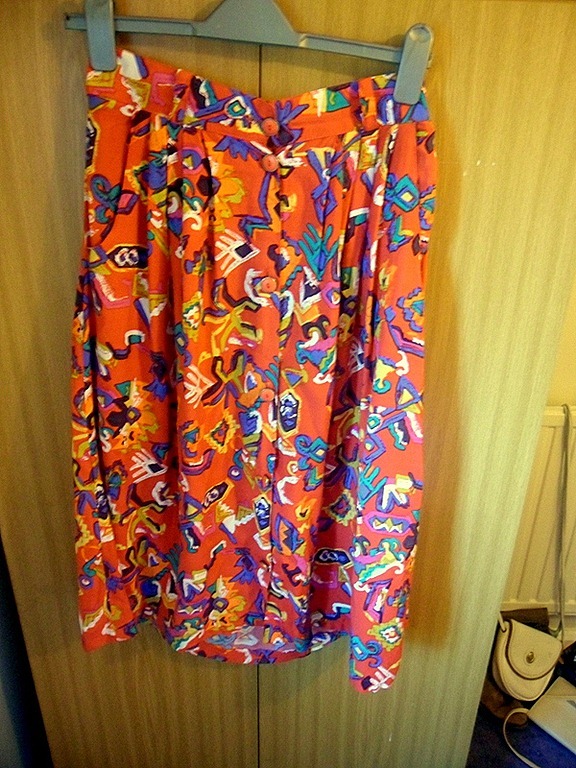 Garish prints and unflattering shapes. Something your gran might try to borrow from you. My eye is naturally drawn to anything with a pattern, the louder the better. I’m imagining teaming the shirt with purple denim shorts and some obnoxious oversized earrings. The skirt is destined to be worn in warm weather, high on the waist, paired with a plain vest, a denim jacket and gladiator sandals. Can you identify with any blogger stereotypes? Which ones leave you baffled? What are your feelings on ‘ugly clothes’? * Intentional two-tone hair, that is. I quite often sport very impressive regrowth because I am just too much of a cheapskate to pay to get my hair dyed as often as is necessary. I’m not sure if mousy brown and unnatural red are very popular ombre colours. Some people pull it off, some people just look like raccoons. Though it baffles me why it’s trendy at all! Haha, I love when people call plain ol’ USED things “vintage.” Nope, it’s just old and busted, sorry. I got worried about the macaron thing, until I realized it’s different from a macaroon. Because trendy or not, I will eat a macaroon any where, any time. Haha yeah, the one that gets me is ‘vintage furniture’ when it’s literally a scabby old couch that someone was giving away. A macaroon is a little flaky coconutty thing, right? Whereas macarons are pretentious Parisian confectionery. I’ve only ever eaten one (not in Paris) and while it was nice enough, it was just a bit nothingy and pointless. I’ve been shopping for furniture on Craigslist…and, oh, I see that one all the time, except around here they like to call “old and scabby” furniture “retro.” No, thank you–I’d like a couch that still has both armrests and a little support left in the cushions. Okay, good. I don’t think I’ve ever had a macaron, but I loooove my macaroons. Or anything coconut. Maybe I would like a coconut macaron, if that’s an option. Blogger stereotypes? Well I drink skinny iced lattes a bit too often but I think that’s more a *posh Cambridge* stereotype! I don’t know which stereotypes I adhere to, what do you think? 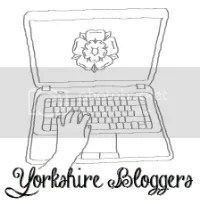 I think if you were to adhere to any stereotypes it would be more healthy living blogger ones – though I don’t really think your blog is stereotypical. That’s one of the reasons I like it, that it’s not just a straight forward ‘here are the healthy things I ate today’ blog like some are – you talk about your life and your condition and post things which are interesting and thought-provoking. I agree with this, your blog has a thought provoking, emotional side to it that many healthy living blogs just… don’t. And thanks for leading me to Lizzy’s blog! I’m going to take my camera back to the shop tomorrow, then who knows how long it will take to fix. But I promise to take an outfit post one day soon, when I have a fully functioning camera and weather that allows me to get my legs out a little bit. No problem :) I hope you enjoy! I feel so honoured that my little post has sparked a little inspiration; thank you Emily :) I’m glad you liked it.